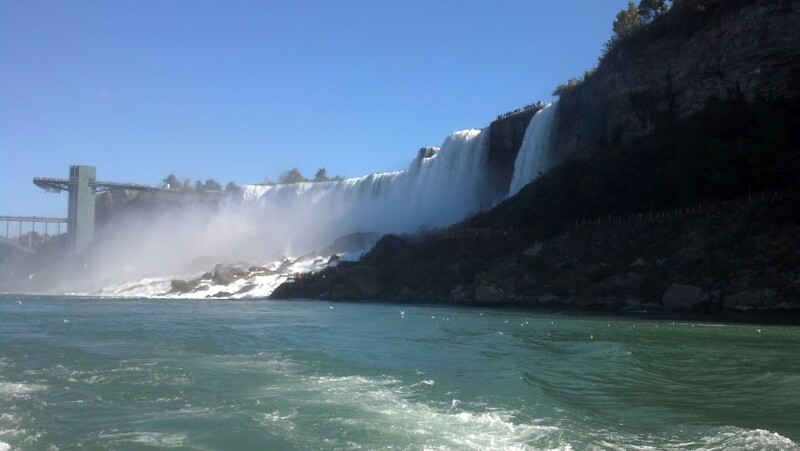 Our 700-passenger catamaran traveled from the dock on the Niagara Great Gorge past the American Falls, Bridal Veil Falls and into the midpoint of Horseshoe Falls. We didn’t get completely soaked—much to The Girl’s dismay—because we chose a relatively dry spot in back of the bottom deck, and we made use of the complimentary souvenir ponchos. 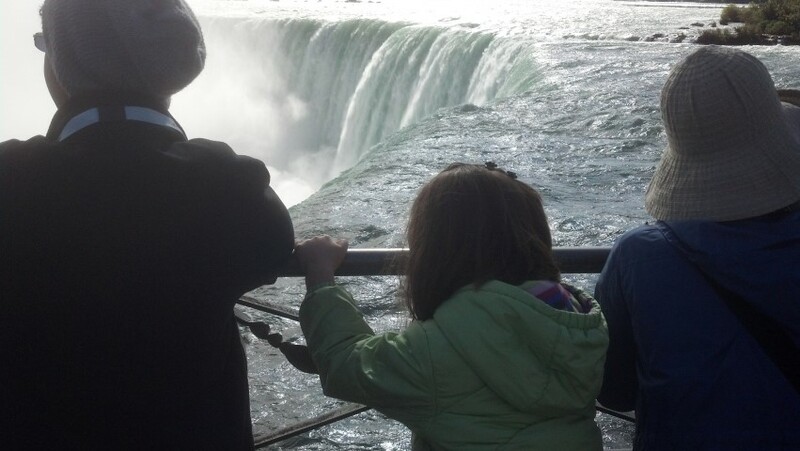 This is another great way to get up close to the falls, and, well, to get even more drenched. Which is a delightful proposition for any seven-year old. From the Table Rock Visitor Centre, you take an elevator down a shaft behind the falls. 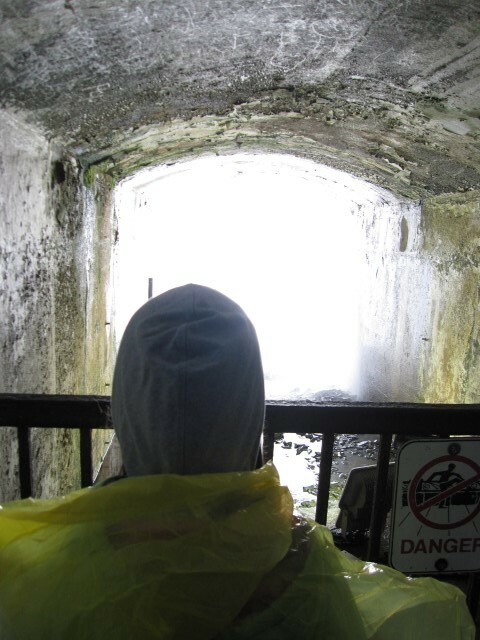 Once you reach 125 feet, you’re released into a tunnel located about one third of the width of Horsehoe Falls. Two shorter, perpendicular tunnels bring you to a gated opening behind the rushing falls. It’s wet, it’s loud, and it’s pretty exhilarating. 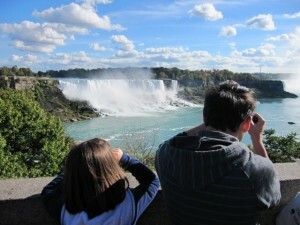 Even more exciting is the bi-level observation deck in front of the falls. The Girl couldn’t get close enough. Having read all about Annie Edson Taylor— the first person to survive a trip over the falls in a barrel in 1901—she was even more intrigued once she could feel the power of the water from 20 feet away. 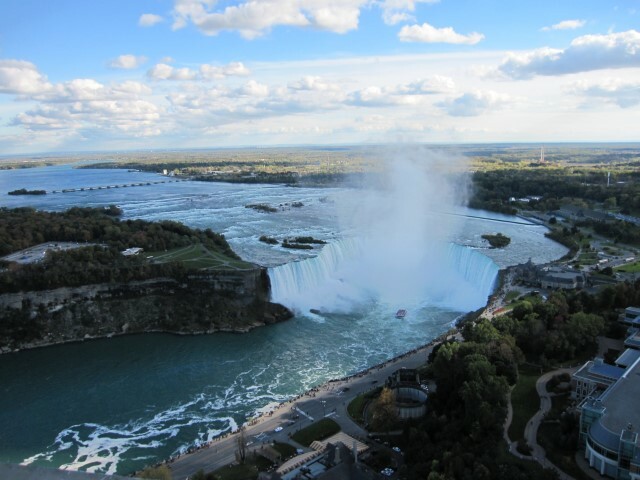 To get great overhead views of the falls, you have several options, including dining in a local restaurant’s top floor, or taking the Incline Railway which connects Portage Road and the visitor center. We did both of these, but we also took the ten-minute ride on the Niagara SkyWheel, a 175-foot tall ferris wheel with 42 climate-controlled, enclosed gondolas. 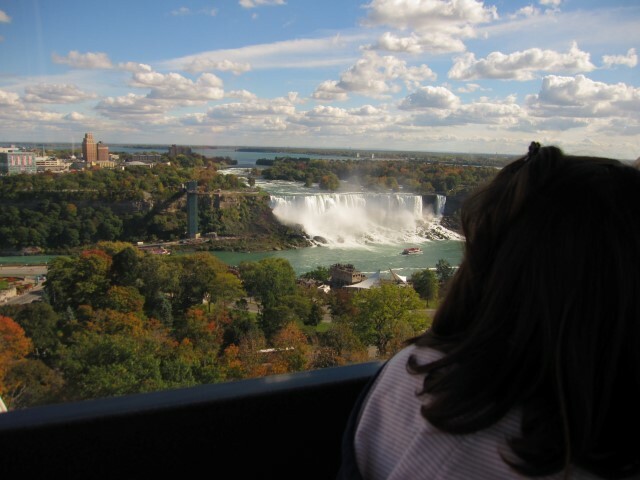 The gondolas have low-glare glass windows, perfect for taking photos of the falls, and the dinosaurs in the mini-golf course directly adjacent! 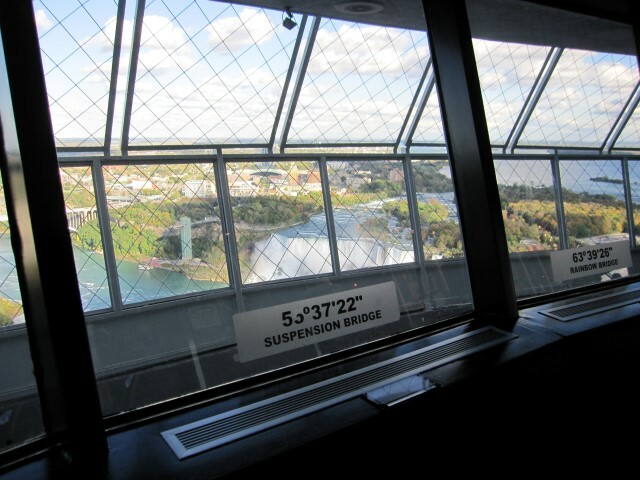 To really push my fear of heights, we took the outdoor elevator of Skylon Tower to the observation decks at 775 feet. You can stay inside, where signs point out the sites visible from each direction. Or you can go out and brave the winds while walking around the circular deck. Worth it! And of course, it’s always a sheer delight to stroll the sidewalk along Niagara Avenue to see the falls at eye level to where the Niagara River drops off in roiling fury. At night, powerful xenon lamps bathe the water in soft color, and during the season, nighttime fireworks shows add to the colorful pageantry. No way I’m going on that observation deck, but what amazing views!!! Go BIGGER- We are exploring South America and we just visited Iguassu Falls in Argentina and it is 3 times bigger than Niagra Falls! You can view it from Brazil or Argentina, although the Argentina side is much larger and has walkways out over the rivers, I’ve heard the Brazil side has much better encompassing view of all of the falls. 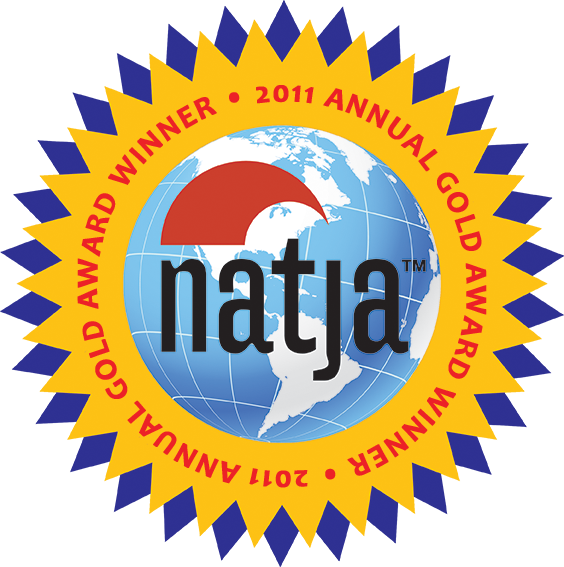 Enjoyed your post and photos, you have done such a great job of narrating your experience! Niagra Falls is on my bucket list.